With The Nature Conservancy, lobstermen are testing the viability of frozen alewives as an alternative to Atlantic herring. Lobstermen and environmentalists are trying to harness the dramatic comeback of the spring alewife to ease their summertime bait problems. Two lobstering co-ops in Tenants Harbor and Port Clyde are working with The Nature Conservancy to see if they can freeze the alewives that bait their traps so successfully each spring to catch lobster at other times of the year. If it works, alewives could be the affordable bait they need when their usual favorite, Atlantic herring, is in short supply, such as it is again this summer. The small schooling fish has always been a favorite bait of Maine lobstermen in May, when they leave the Atlantic to lay their eggs in Maine’s rivers, lakes and ponds. At that time of the year, alewives attract hard-shell lobsters even better than fresh Atlantic herring, which in spring can be too mushy to fish well, lobstermen say. Best of all, spring alewives cost about half as much as herring. Work being done by environmental groups like The Nature Conservancy to remove dams and restore fish runs on the Kennebec, Penobscot and St. Croix rivers, among others, has led to a huge comeback of the alewife, whose numbers are increasing. This surge has also meant an increase in the number of commercial runs, and the availability of alewives as lobster bait. But the alewife run lasts for only six weeks, and by June, lobstermen must return to herring – when they can find it and pay for it. 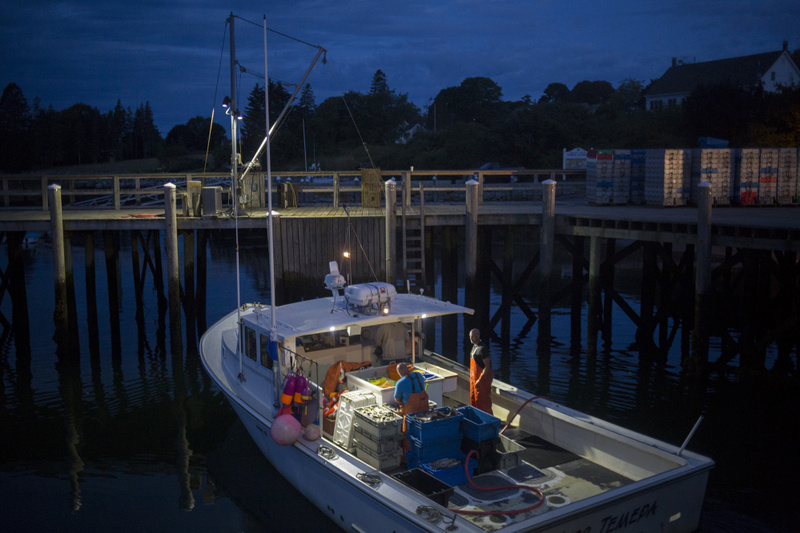 In recent years, lobstermen have endured shortages and big price swings when the fishermen off Georges Bank can’t catch herring, or when, like now, the Gulf of Maine herring aren’t schooling in deep enough waters for the purse seining boats to capture, either. Midcoast herring prices started off at $155 a barrel but the price has jumped to $170 a barrel. Those prices make lobstermen long for the fresh alewives they bought in May in Warren and Damariscotta for about $125 a barrel. 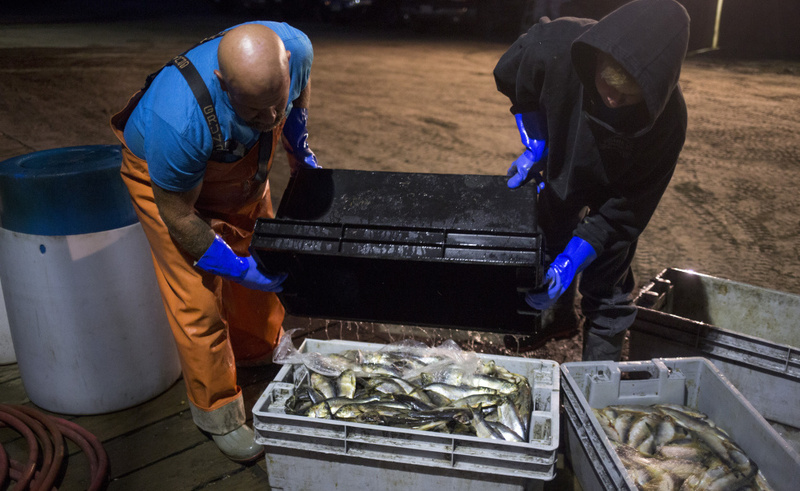 This year, while lobstermen are testing the frozen alewives’ suitability as bait, The Nature Conservancy is paying for the cost of buying the fish and hauling them back from the runs to the rented refrigerated storage unit that is parked about 3 miles from the Tenants Harbor wharf. In all, it’s a $30,000 project. The environmental group is still tallying up the true price of fishing with frozen alewives. Geoff Smith, the marine director for the group’s Maine chapter, said the prices will only go down as the number of alewives increase, which is likely as groups like The Nature Conservancy join with the Maine Department of Marine Resources to restore more fish runs and remove more dams. The project has caught the eye of the state marine resources commissioner, Patrick Keliher. The Tenants Harbor co-op is also considering whether to invest in buying or building its own freezer space to keep bait storage prices in house, possibly with the help of grant funds from groups like The Nature Conservancy. But before anyone considers expanding the project, both fishermen and the scientists must first answer the big question: Do frozen alewives work well as bait? So far, the answer is yes. Ten lobstermen from Tenants Harbor and Port Clyde have been running side-by-side trap tests, with one trap full of herring and one trap full of frozen alewives, to see if the alewives fish as well as the herring. Some traps are being set inshore, while others have been laid in deeper waters offshore, with the herring and alewives never more than 36 feet apart. The fishermen have run through more than half of the 42 barrels of frozen alewives. While not all of them have shared the results of their logbooks with The Nature Conservancy yet, they have talked about them at co-op meetings, and so far, at least in Tenants Harbor, the frozen alewives have been performing nearly as well or as well as herring, for both hard-shell lobsters and shedders. On a recent morning in Tenants Harbor, Peter Miller peeled back the pages of his yellow logbook to run that week’s numbers. He had trapped 43 keepers in his traps baited with frozen alewives, and 50 keepers in his herring traps. That differential is small enough for him to turn to the frozen alewives if herring prices climb much higher than they are now, Miller said. While Miller has gotten more mileage out of his alewives than his herring, using fewer fish to stuff each bait bag, his son, Josh, has found that he can’t leave the alewife-baited traps out as long to set as his herring-baited traps. In the summertime, that’s no problem, as boats tend to pull up all their traps every few days, but in winter, the traps sometimes have to set longer because of weather. But Josh Miller also sees little difference in the number of lobsters he finds in an alewife-baited trap than a herring-baited one.